100 Days clubbers Lynn Munsinger (L) and Rob Kovalesky (R) celebrated another ski season that saw them on the hill well over 100 days each. Pictured in the background are two other members of the 100 Days Club: Peggy Golonka (a.k.a. “Mrs. G.”) and Don McNeil (a.k.a. “Shortski”) who logged 136 and 192 days ,respectively. If being a true ski bum means skiing as much as possible, Killington has some contenders! Don McNeil (a.k.a. “Shortski”) had perfect attendance of 192 days skiing at Killington out of the 192 days of lift operations at the resort! That’s almost six and a half months of skiing every day! 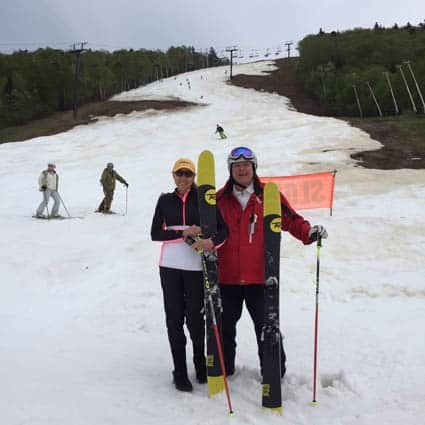 Rob Kovalesky and Lynn Munsinger combined to ski 264 days, with the last day being closing day, Memorial Day Monday, May 25. Memorial Day marked Kovalesky’s 155th day on the slopes, his personal best! While Lynn remained off the slopes for the season, she resumed playing golf just six weeks after surgery and she made it a point to come to Superstar for the traditional annual closing day photo with Kovalesky. Lynn is already looking forward to the next ski season to begin in October!